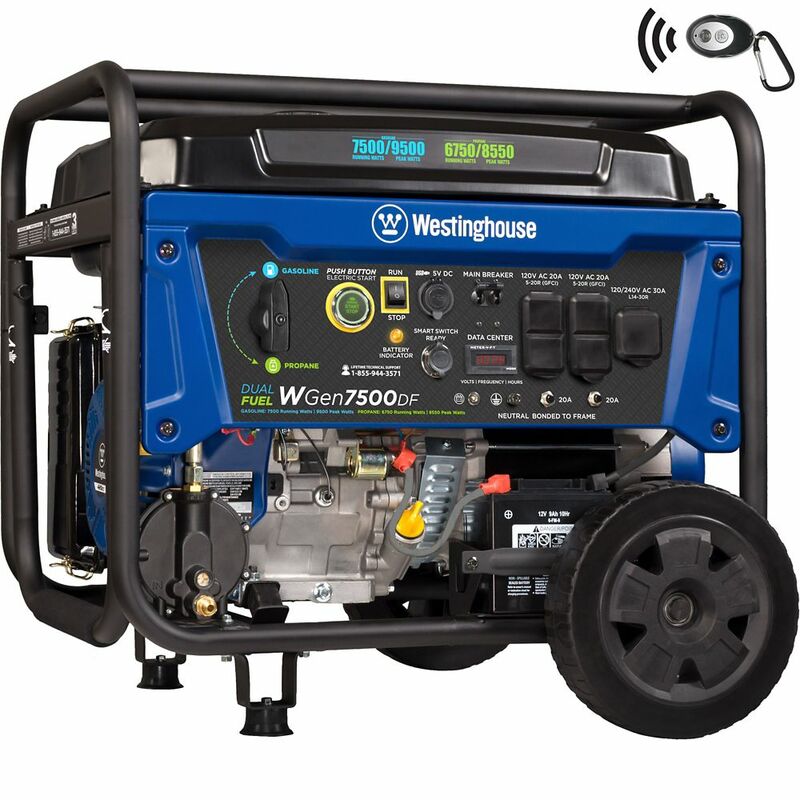 The Westinghouse WGen7500DF Dual Fuel Portable Generator is a powerful and versatile backup power solution for your home in emergency situations. Producing 9,500 peak watts and 7,500 running watts using gasoline as well as 8,550 peak watts and 6,750 running watts using propane (LPG), this generator provides convenient versatility. The WGen7500DF features Push-Button Electric Start, remote start with included key fob, and backup recoil start in case of emergency. Built with a 720cc Westinghouse OHV Engine, the powerful WGen7500DF can run for up to 16 hours on 6.6 Gal. (25 L) fuel tank. A built-in extendable handle and rugged never-flat wheels makes maneuvering the WGen7500DF easy, and it's loaded with safety features such as Automatic Low Oil Shutdown, voltage regulation, and VFT data center which displays volts, frequency and lifetime hours. The WGen7500DF portable generator is backed by a 3-year limited warranty and Westinghouse's lifetime technical support. WGen7500DF Dual Fuel Portable Generator The Westinghouse WGen7500DF Dual Fuel Portable Generator is a powerful and versatile backup power solution for your home in emergency situations. Producing 9,500 peak watts and 7,500 running watts using gasoline as well as 8,550 peak watts and 6,750 running watts using propane (LPG), this generator provides convenient versatility. The WGen7500DF features Push-Button Electric Start, remote start with included key fob, and backup recoil start in case of emergency. Built with a 720cc Westinghouse OHV Engine, the powerful WGen7500DF can run for up to 16 hours on 6.6 Gal. (25 L) fuel tank. A built-in extendable handle and rugged never-flat wheels makes maneuvering the WGen7500DF easy, and it's loaded with safety features such as Automatic Low Oil Shutdown, voltage regulation, and VFT data center which displays volts, frequency and lifetime hours. WGen7500DF Dual Fuel Portable Generator is rated 4.5 out of 5 by 97. Rated 5 out of 5 by Gary from Had good results for set up except for the... Had good results for set up except for the hose and regulator being missing in the package. Called Westinghouse and they are sending one. Ran it on the job site and liked the remote start. Would be great if they would come up with a low idle on it. A little noisy but was expecting that. Rated 5 out of 5 by Hal from Great generator has all the features I was looking for,... Great generator has all the features I was looking for, not as loud as I thought it might be, and that little remote control has a lot more range also. Rated 5 out of 5 by Michael from Generator works great is runs quiet.... Generator works great is runs quiet. Rated 5 out of 5 by ohmslaw from Easy to set up and start. Plenty of power. ... Easy to set up and start. Plenty of power. The electric start feature is great and includes a charger to keep it ready to start for back up power. Rated 4 out of 5 by Gameman from I didn't research enough. When using the propane fuel option you lose ten percent of power. Tha... I didn't research enough. When using the propane fuel option you lose ten percent of power. That was the only disappointment I have It is a great generator!